He's camping outdoors with students at his school for the next two nights, and we just had our first snow in weeks. And it wasn't even a light snow -- four-plus inches, with temps dropping tonight to 15, more snow expected tonight and tomorrow, and a low tomorrow night of 9. Yep, that's single digits. 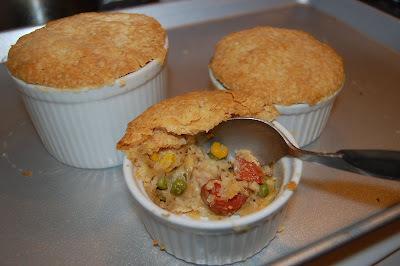 All this chilly, we're-not-out-of-winter-yet weather calls for comfort food, and what's more comforting than chicken pot pie? But because it'll be just me for the next few days, I didn't want to make a whole pie. Instead, last night I found a new use for my ramekins. I started by thawing two Marie Callendar's frozen pie crusts. I know how to make crust, but time was tight and I just wanted to get cracking on the filling. I'd also thawed two chicken breasts (from Costco -- they come in six separately packaged pairs, so you can easily thaw a few at a time), then cut them into about 1-inch cubes. In hindsight, I think I'd probably cut the chicken smaller, but that might be less of an issue if you're making a big pie instead of little ones. I cut three medium-sized red carrots into smaller pieces, about 3/4-inch square, and put the carrots and chicken in boiling water until they were cooked through, about 15 minutes. These were drained and set aside, then I rinsed out the pot to reuse it for the next step. I lowered the heat to a little less than medium, melted a cube of butter, and added a diced onion, fresh-ground black pepper to taste, about a tablespoon of red pepper flakes (which was noticeable but not overwhelming in the finished product, so adjust to your taste) and about half a tablespoon of celery seed (mine is a little old, so if yours is fresh, use less). I cooked until the onion got soft and transparent. The butter ended up getting a little too bubbly and brown, so I probably should have turned the heat down a little more. Into the same pot, I added about half a cup of flour, 2 cups of chicken broth, 1/3 cup half-and-half and 2/3 cup milk, a cup or so of frozen peas and a cup or so of canned corn. This mixture will thicken pretty quickly, so stir frequently and keep an eye on. I kept it warm until the peas were almost thawed. Then I tasted, and added a little salt, but you might not need to add any if your broth is saltier than mine. The crust split as it thawed, so I mushed it back together at the splits, tore off pieces, and lined the ramekins -- it was quite the cut-and-paste job -- leaving whole pieces aside to be the tops of the pies. At the end, I didn't have enough unbroken pieces to top all the pies, so I balled together the bits left over and rolled them out with a rolling pin. Worked beautifully, though be careful not to overwork the dough, because it will lose its awesome flakiness. A few tablespoons of the filling went into each mini pie, then I pressed the cover crust onto and over the edges, poking a few knife holes into each to vent. I baked these at 425 for about 45 minutes, or until the crust was golden, then let cool for 10 minutes before serving.